Canberra, Australia: Intersex is not Invisible! 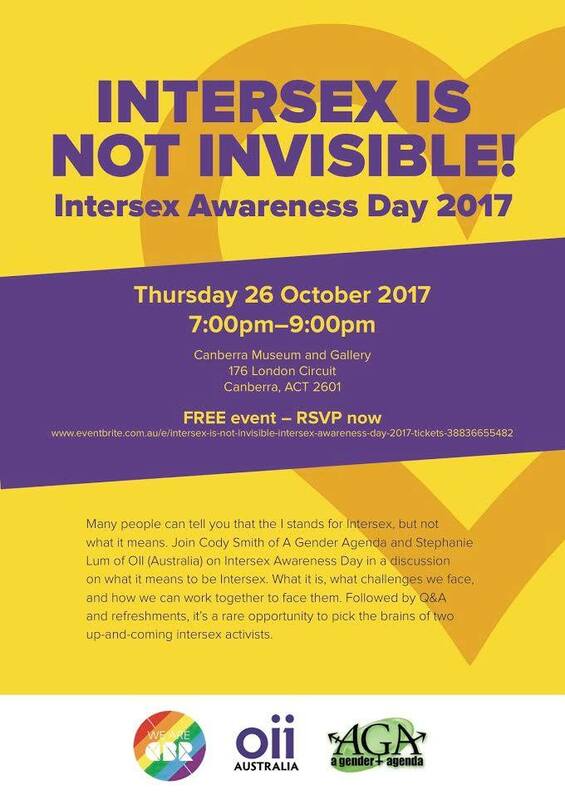 On Intersex Awareness Day, 26 October, Cody Smith (A Gender Agenda) and Steph Lum (OII Australia) will speak at an event at Canberra Museum and Gallery Theatrette. Many people can tell you that the I stands for Intersex, but not what it means. Join Cody Smith of AGA and Stephanie Lum of OII (Australia) on Intersex Awareness Day in a discussion on what it means to be Intersex. What it is, what challenges we face, and how we can work together to face them. Followed by Q&A and refreshments, it’s a rare opportunity to pick the brains of two up-and-coming intersex activists. Location: Canberra Museum + Gallery Theatrette Cnr London Circuit and City Square, Canberra City (Theatrette entry via London Circuit).